Collecting Vintage and Contemporary Jewelry: How did your love for vintage jewelry start? It's hard to say when I first became enamored by vintage jewelry. 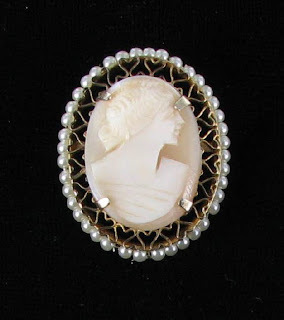 I think the actual beginning may have been in the 1970s when I purchased my very first carved shell cameo pin as a young student at college. I have always been a romantic at heart and the carving in the shell attracted me like a moth to a flame. I just had to have that piece of jewelry, even though I could hardly afford my rent. The style was similar to the one shown here, with the heart designed setting, but had no pearls. Over the years, I picked up pieces here and there, but I was never a person who wore much jewelry. Most of my treasures just stayed in my jewelry box and I would take them out from time to time to admire. I've always been involved in fashion as a business, and eventually came to settle on vintage jewelry as my main focus. The years passed and I got married and had a daughter. My precious girl wore her first strand of pearls at the age of 12 months. (actually more like 7 or 8 strands all at once!) Such a far cry from her mom who love jewelry but rarely wears it. She has always been interested in anything glitzy and her babysitters used to play dress up with her. During these sessions, jewelry was always front and center. During her teenage years, I had a hard time keeping any jewelry to resell, since she always wanted first dibs on the jewelry I was sorting. My tastes in jewelry kept changing, often in step with the styles she liked at the time. We would sit for hours sorting and cleaning jewelry. She opened the box and gave me a few "to consider", all the while stacking up a pile for "herself" as a payment for helping me. Those years are so special to me and are the main reason I'm in the vintage jewelry business today. Every time I sort estate collections that come my way, I am reminded of the special years I spent with Jess. What is your story? Please share!